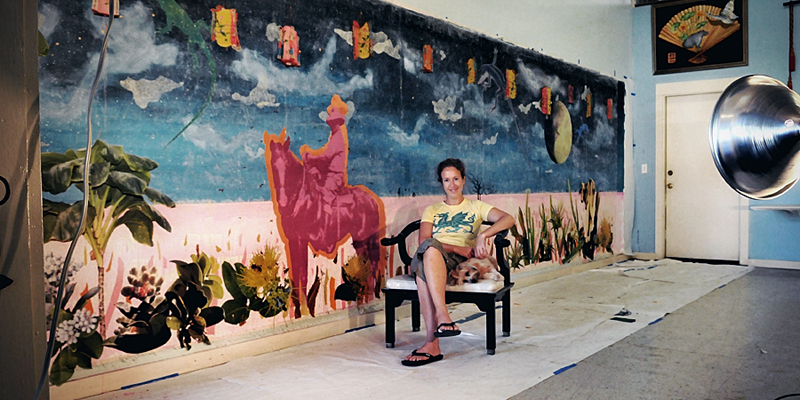 Margo Ray in her studio. Photo by Sally Lundburg. 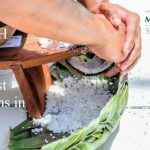 Hawai‘i Island artist Margo Ray, a printmaker, book artist and painter, born and raised in Hawai‘i, has a successful, growing career shaped in part by her studies at the University of Hawai‘i at Hilo. 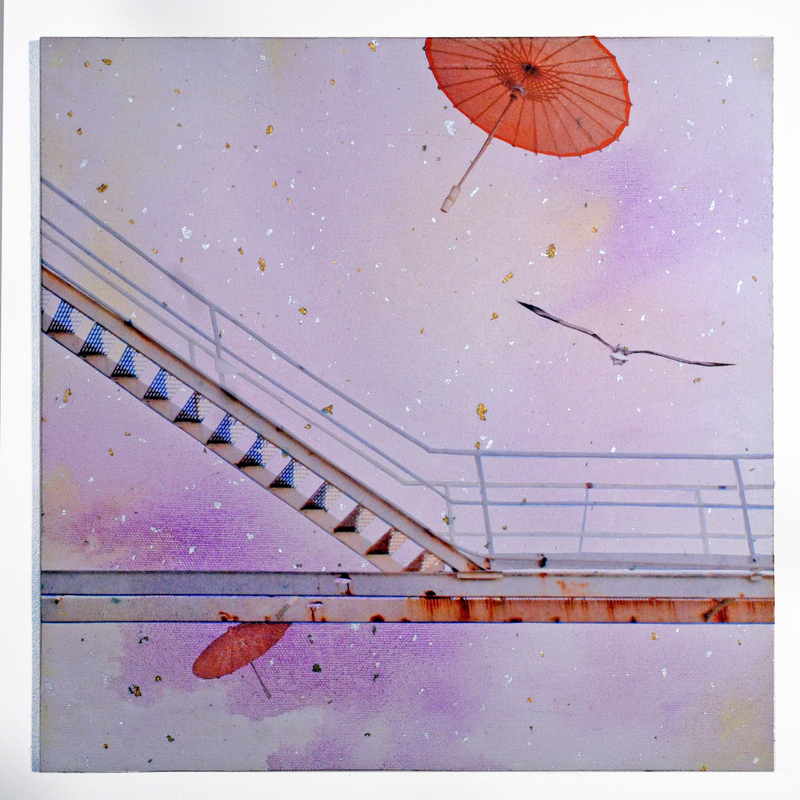 This panel by UH Hilo alumna Margo Ray, entitled, Somewhere Near and Far: Ascension #2 — along with two other works of hers (see end of post) — will be shown at the Honolulu Museum of Art Contempo 2015 in June. Mixed media on panel. 2014. Click to enlarge. All photos used with permission. Ray earned her bachelor of arts in studio arts from UH Hilo, where she graduated with honors in 2002. 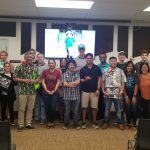 UH Hilo, with its average class size of 22 students and a 1:15 student-to-faculty ratio, proved beneficial since Ray received strong support from her teachers. Ray continued her studies and earned her master of fine arts in print media from Concordia University in Montreal, Quebec, in 2006. Many of Ray’s works include images of water tanks. 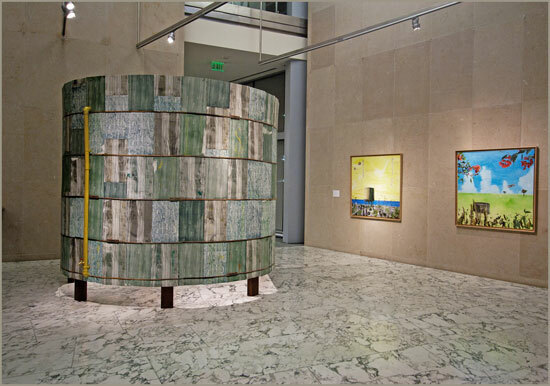 In this installation — entitled, Between Worlds, Waters Flow — the exterior view shows a construction of screen prints on panels. 8.5′ in diameter by 9′ high. 2010. Courtesy photo. 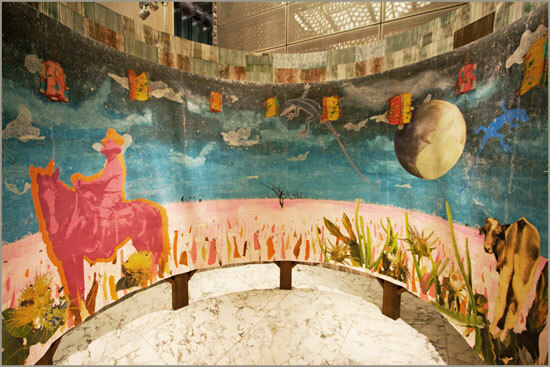 This is the interior of Between Worlds, Waters Flow (exterior shown above). Gouache, layered paper, photo collage on canvas. 8.5′ in diameter by 9′ high. 2010. Courtesy photo. 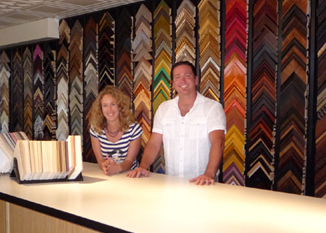 Margo Ray and husband Scott Yoell at their business, Ironwood Custom Framing and Design, in Waimea. Courtesy photo. 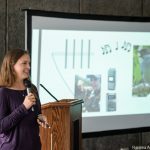 Since earning her master’s degree, Ray has done residencies in Quebec, California, and Newfoundland. She met her husband, Scott Yoell, a Canadian from Windsor, Ontario, when they both lived in Montréal. 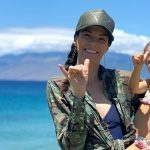 They now call home a farm in Honoka‘a on the Hamakua Coast of Hawai‘i Island, and together the couple owns Ironwood Custom Framing and Design in Waimea. Ray has a unique art style, the subject of a 2009 HI Art Magazine article written by fellow artist and colleague, Sally Lunburg. (Margo) is deeply influenced by author Haruki Murakami for his cross-cultural take on fantastical and surreal situations that he inserts into everyday circumstances, and Frieda Kahlo’s use of intense, vibrant colors and loaded symbolism in her paintings. 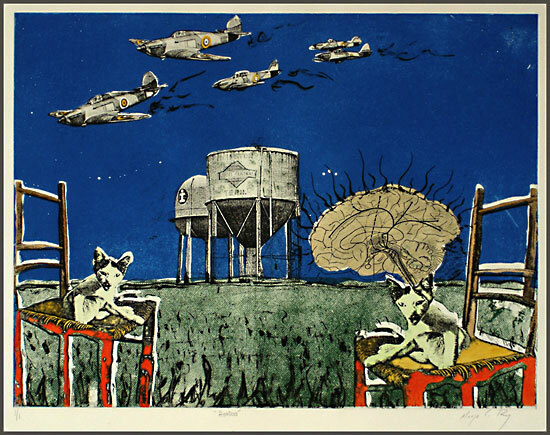 William Kentridge has also been influential through his examination of self in his political and social surroundings as well as his fluid movement between mediums; print, sculpture, drawing and animation. Barbara Kruger and Jenny Holzer’s use of collage, compound imagery and text have continued to inform Margo’s practice. All of these artists work embrace a fantastic and metaphysical take on the political and social condition of contemporary life. On Ray’s website, she explains her artistic style. Postcards, Snapshots and Collected Lamentations. Detail. 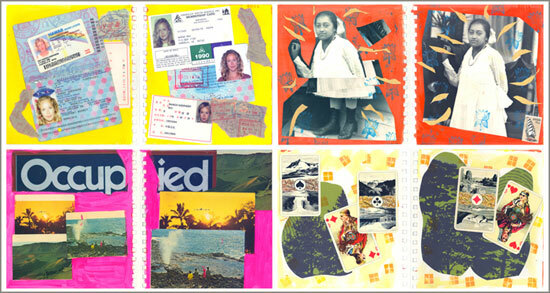 Mixed media collages on paper. Individually 8”x 8”. 2009. Click to enlarge. Courtesy photo. Ray is inspired by the Hawaiian landscape she grew up with and the “wild west” concept of American myth. HooDoo. Intaglio print, 26″ x 20″. 2003. Courtesy photo. Click to enlarge. Ray has shown in galleries ranging from The Parisian Laundry in Montreal, Quebec, the Artists Book Collection at Bibliotheque Nationale du Quebec, and Second Street Gallery in Charlottesville, Virginia. In Honolulu, she has shown at the former Contemporary Museum (now merged with the Honolulu Academy of Arts) and the Hawai‘i State Foundation on Culture and the Arts. Since 2010, Ray has been a member of AGGROculture, a Hawai‘i-based art collective, along with fellow members Keith Tallett (also a UH Hilo alum), Sally Lundburg, and Ray’s husband Scott Yoell. Somewhere Near and Far: Ascension #3. Mixed media on panel. 2014. This piece will be shown at the Honolulu Museum of Art Contempo 2015 this June. Courtesy photo. Click to enlarge. 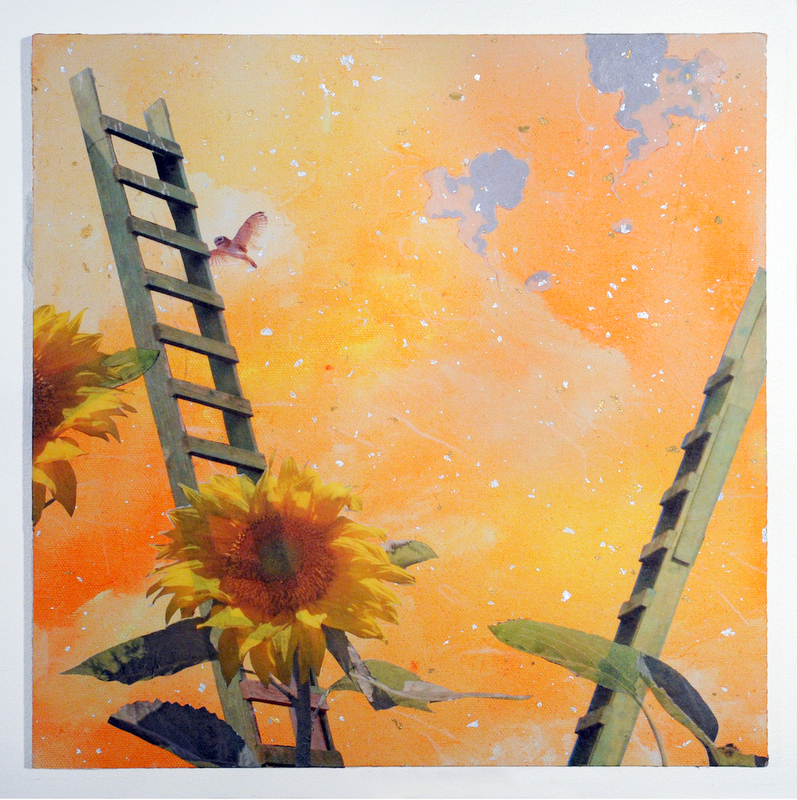 Ray will show three new pieces at the Honolulu Museum of Art Contempo 2015 this coming June. The titles are: Somewhere Near and Far: Crossings #2; Somewhere Near and Far: Ascension #2; and Somewhere Near and Far: Ascension #3. All three are mixed media on panel. 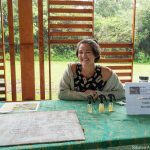 Ray is currently in the process of building a printmaking studio on her farm in Honoka‘a. This year she is working on a project with her AGGROculture group called, “The Rat and The Octopus” — Ray, Tallett, Lundburg, and Yoell will have a solo exhibition for the project at the Schaefer International Gallery at the Maui Arts and Cultural Center in 2016. Somewhere Near and Far: Crossings #2. Mixed media on panel. 2014. 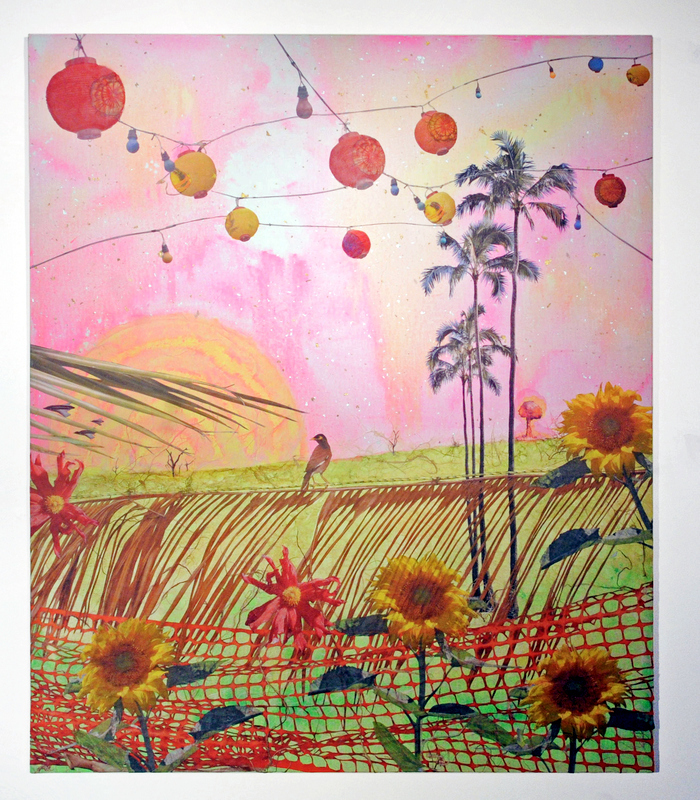 This piece will show this June at the Honolulu Museum of Art Contempo 2015. Courtesy photo.